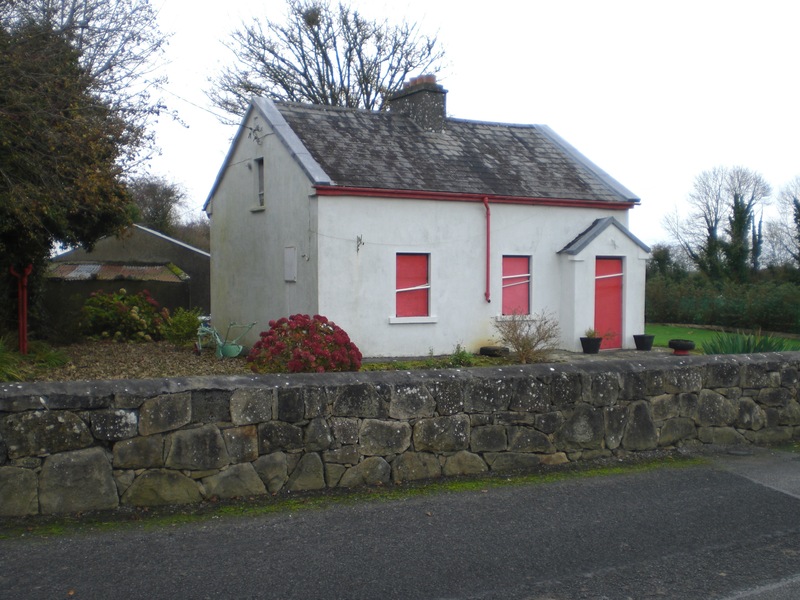 The Hutchinson Family, Abbeyville, Abbey, Co Galway, John and his wife Mary are listed on the 1901 and 1911 census. They had seven children, four sons and three daughters. Mary’s mother, Bridget Martin, also lived with them. Records show that in 1908 one of their sons, Patrick, made his Confirmation and, as was the custom at that time, took the Pledge to abstain from all intoxicating drink until the age of twenty-one. The family later moved to a cottage in Abbey Village. One of the Hutchinson daughters, Bridget, married Mick Slattery. Two of Bridget’s brothers, Michael and Patrick, emigrated to the United States and made their homes in Boston. Bridget and Mick Slattery had five children and they continued to live in the Hutchinson home in Abbey. One of their daughters, Mary Slattery, trained as a nurse in England and married Alan Wright in 1950. 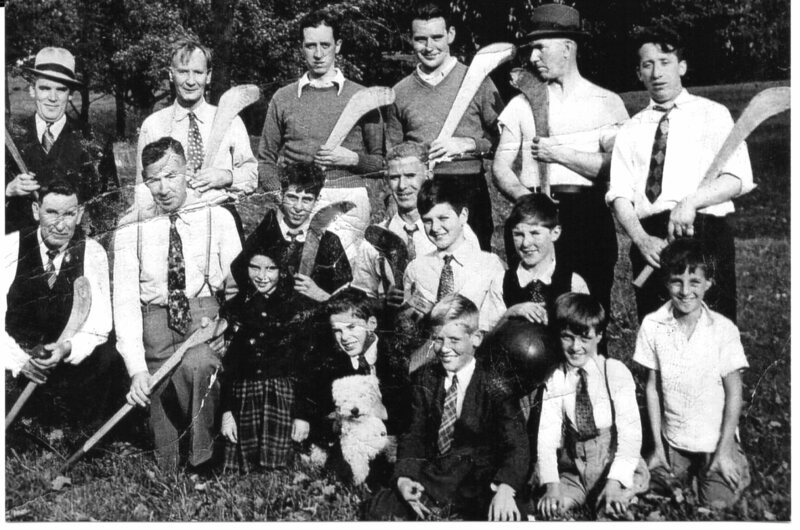 Both of the Hutchinson brothers, Michael, by then known as Mick and Patrick called Paddy, played hurling in Boston with the Clare Hurling Club and were members of the successful Champions of Massachusetts team in 1928. 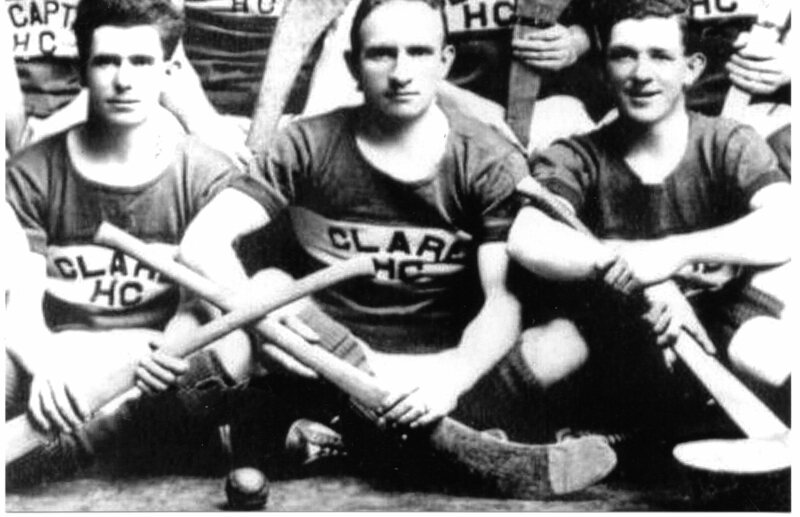 Paddy Hutchinson, J F Turner and Mick Hutchinson who played on the 1928 Champions of Massachusetts team. Photo courtesy Joanie Durgin. 1928 Champions of Massachusetts team: Back Row: N S Turner, President; J Concannon, Manager; J A Turner; M Wren; M Howard; M Vaughan, Treasurer; C V Turner; M F Naughton; T J Hurley, Secretary. 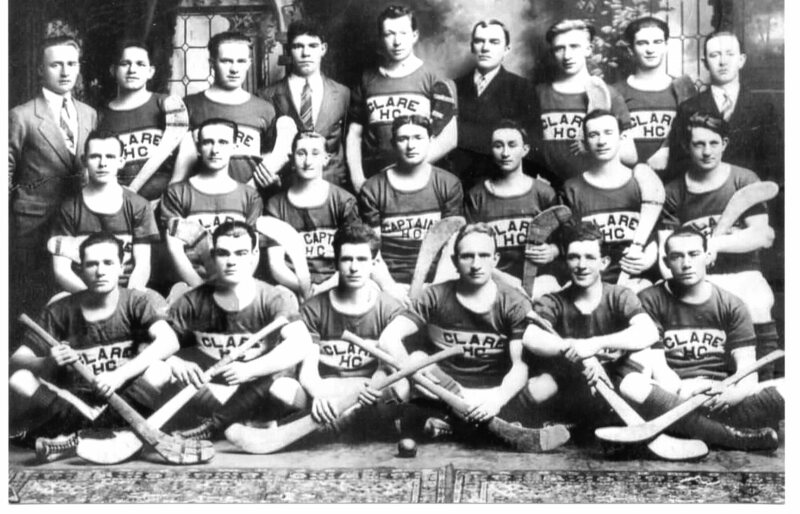 Middle Row: J Brown; A Maloney; P Keffe, Vice Captain; P Reilly, Captain; P Loughman; P J Naughton; T Gough; Front Row: J B McAllister; B Murray; P J Hutchinson; J F Turner; M Hutchinson; M T Joyce. This photo, taken in the 1940s shows Patrick Hutchinson kneeling 4th from left; his daughter Joan, only girl in photo; next to her, his son James holding dog. James was later ordained Fr James Hutchinson; Joseph Hutchinson holding large ball is in the 2nd row, 2nd from right. Photo courtesy Joanie Durgin. 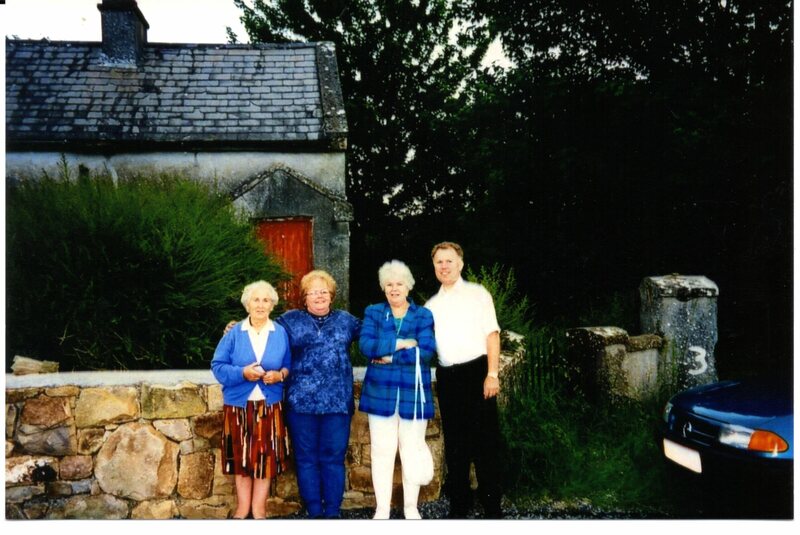 In 1994, Joan Comer and Maureen Danforth, both daughters of Paddy Hutchinson and Joan’s daughter, Joanie Durgin, visited Abbey with their cousin Mary Wright and her son Michael, as part of their trip to Ireland. Below are some photographs from that trip. 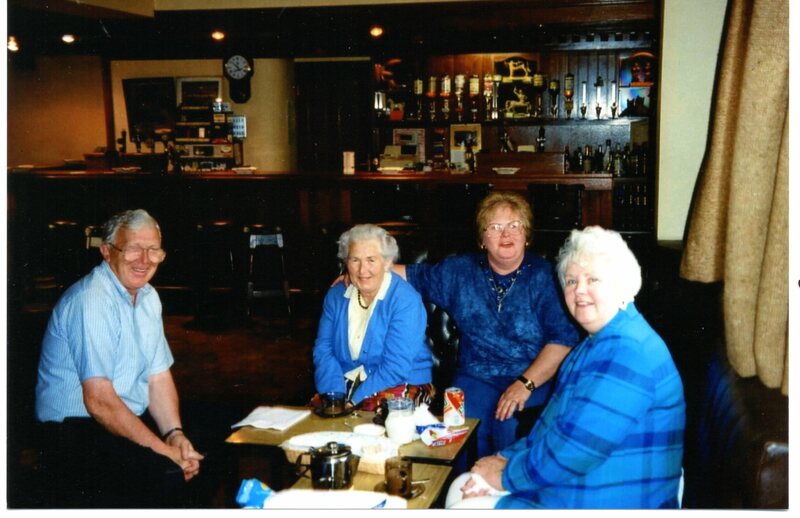 In Holohan’s Bar, Abbey from left: John Holohan, Mary (Slattery) Wright, Maureen (Hutchinson) Danforth, Joan (Hutchinson) Comer. Photo courtesy Michael Wright. In 1994 taken outside the old homestead from left: Mary, Maureen, Joan and Michael. Photo courtesy: Joanie Durgin. 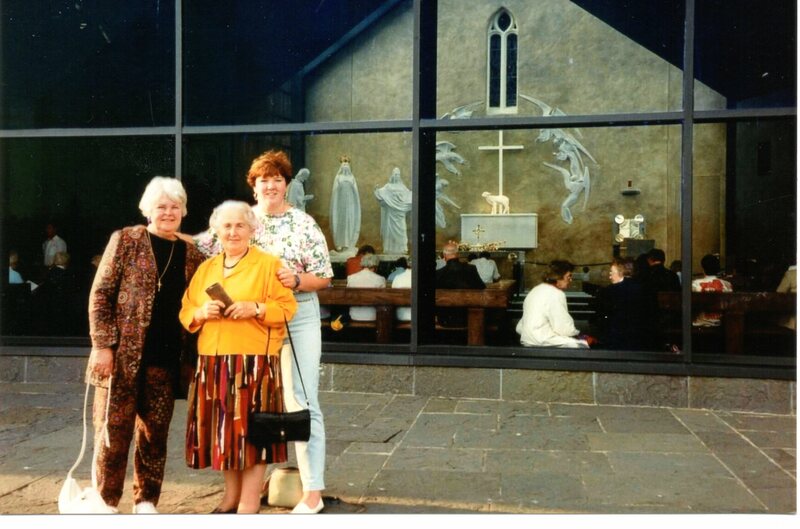 Visiting Knock Shrine during their trip to Ireland: Joan (Hutchinson) Comer, Mary (Slattery) Wright, Joanie (Comer) Durgin. 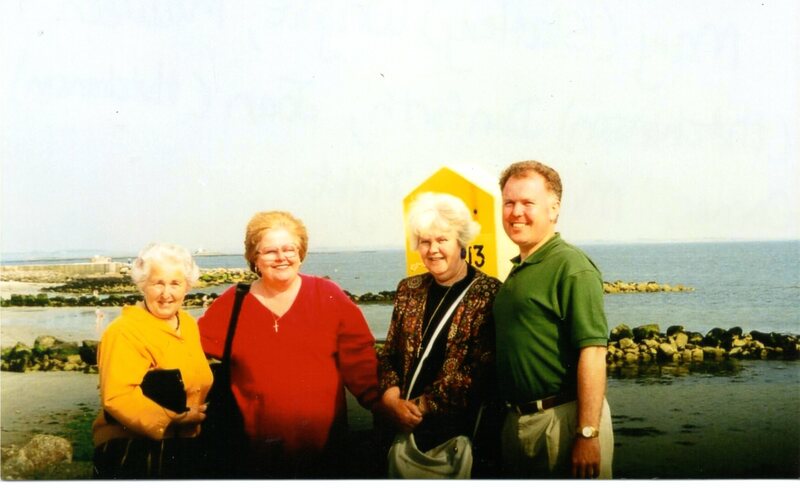 Visiting Galway in 1994 from left: Mary Wright, Maureen Danforth, Joan Comer and Michael Wright. Photo courtesy Joanie Durgin. Patrick Hutchinson’s grand-daughter, Joanie Comer Durgin has taken a great interest in the family history and we thank her for donating most of the photographs in this article. The Hutchinson/Slattery home in Abbey still stands although not currently occupied. Bought many years ago, the owner has restored it with great care. This page was added on 31/10/2017. What a great web page this is. 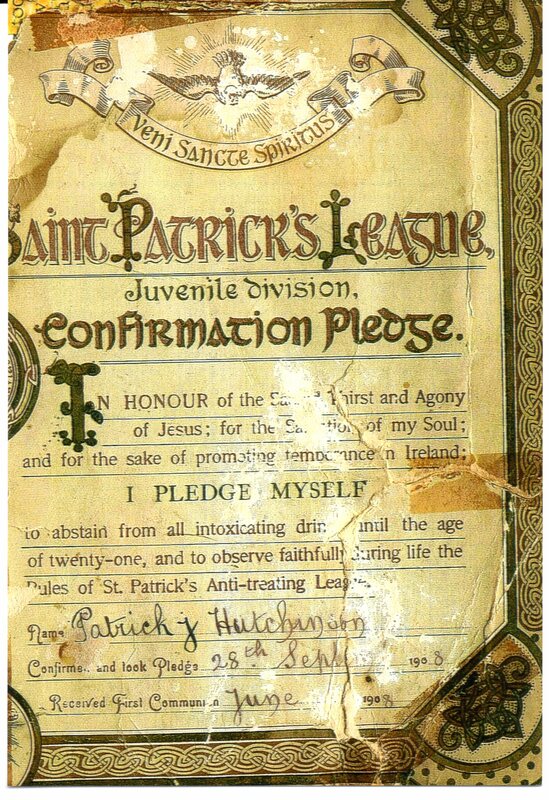 I am Maureen Hutchinson Danforth/ daughter of Patrick(Paddy) Hutchinson. My trip to Ireland in 1994 and walking the land my father spoke of so much was a thrill of a lifetime. Thanks to my niece/Joanie and her keeping of my fathers photos and his memories I am forever blessed to be Irish.